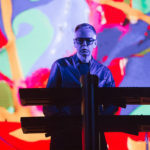 By the time Depeche Mode’s Global Spirit Tour completes in the summer of 2018 it will have been experienced by over 1.6 million fans at 110 concerts taking place in Europe; North America and Latin America. Louder Than War’s Katie Clare (words) and Melanie Smith (photos) went along to the 64th date of this mammoth tour at the Manchester Arena. The last Depeche Mode album I got excited about, counting down the days excited, was Violator. That is not to say I didn’t pick up Songs of Faith and Devotion, Ultra and so on. I did, I just no longer felt invested in the same way. However, now taking a step back and considering those thirteen studio albums, a handful of live and compilation albums, they are all in some way a significant part of one’s life soundtrack. They’ve not only entertained and commiserated, they’ve impacted on character, on held convictions and lived by ethics. With the release of album fourteen and a worldwide tour, it is time to reinvest some emotion into Depeche Mode. Spirt, is an album of rage-filled laments. But to what? The current climate of asinine ruling bodies? The repellent resurgence of right-wing tenets? Whatever harmfulness’s humans are currently performing or vocalising on themselves? Having somewhat binged on Morrissey’s Low in High School all day, an album that overflows with allegories (some troubling) and whimsical musical nuances. Following with Spirit; it is easy to note that the discourse is a little cumbersome and fractured. However, the classic Depeche Mode vibe is very much present. Mixing in some rock, some blues and some fuzzy indie means that Spirit does deliver an appealing and cohesive package. 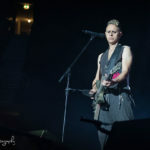 With this thought in mind, the auditorium lights go out the band and Andy Fletcher, Martin Gore and touring as well as contributing band members Peter Dean Gordeno and Christian Eigne appear on the Manchester Arena stage. Not one to waste a grand entrance Dave Gahan bounds up the steps to a platform mindset along the mid-way point of the giant projection at the back of the stage. The audience vocally shows their approval wasting no time the band launch into Going Backwards. Surprising not sticking with Spirit we have a six track delve into the back catalogue It’s No Good, some beautiful Gore guitar melody lightens the somewhat narcissistic perhaps sinister edge to a story of unrequited love and now fully warmed up Gahan is making serious use of not only the stage but also shaking his tush like his very life depended on regular and multiple well-executed shimmies. 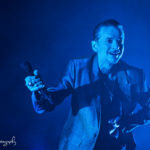 The band seem energised and in good-humoured, the most honest way of explaining it is that Depeche Mode are radiating joyfulness. 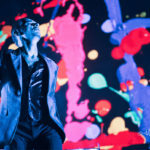 Despite the insolent grinding mechanicalness of Barrel of Gun, Gahan continues to share his new-found physicality elongating his torso, his limbs, strutting and flirting even; rarely pausing. It looks like freedom, it looks like happiness and the movements fill you with exhilaration as you get caught up in watching, Gore too is bolder and more connected with the audience. This is not the same band I last saw live in 97 and 98. 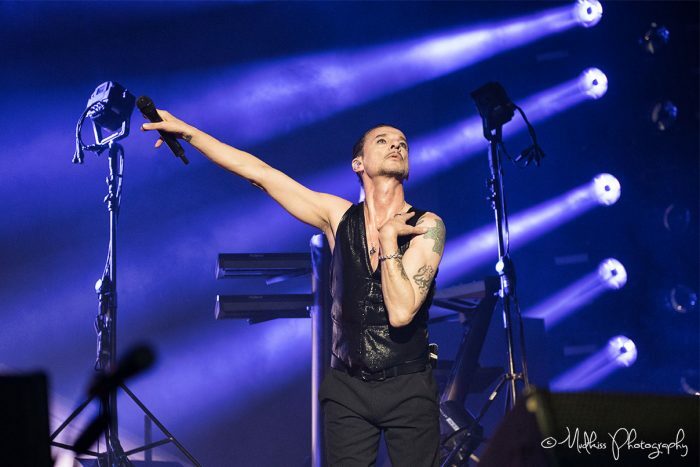 While Gahan may have found his inner ballerina, he is not the only performance on display. Anton Corbijn’s background visuals are a rich saturnine treat all their own. Your only snapped out of a prolonged, almost hypnotised, gaze during sections where these are swapped out for stage enveloping primary colours that do battle with the black shadow of the barely lit arena. Neon colour filtered animals, sign-carrying emo hipsters and the morning routine of a bar worker are particularly fascinating. The encore is a beautiful capsule set, starting with Core delivering an evocative Judas, the audience continuing to sound out the melody as the band start Walking In My Shoes. The tempo increases for the final hurrahs. A Question of Time its frantic momentum and thrashing beat is delivered beautifully and Personal Jesus dripping with dark-tinged lusciousness whip things up to a satisfying resolution. It is surprising to only experience three tracks from Spirit one of which, Where’s the Revolution feels like the weakest; a somewhat paint by numbers stadium anthem. However, it truly would be a disservice to mark Depeche Mode with the nostalgia act tag. They have history, yes, an extensive, impressive and influential one. One which ranges from brutal and bold sweeping soundscapes to the tenderest honestly exposed poetries. Gahan’s amatory smooth baritone, Gore’s expansive angelic range and the enchantment that they create when harmonised. 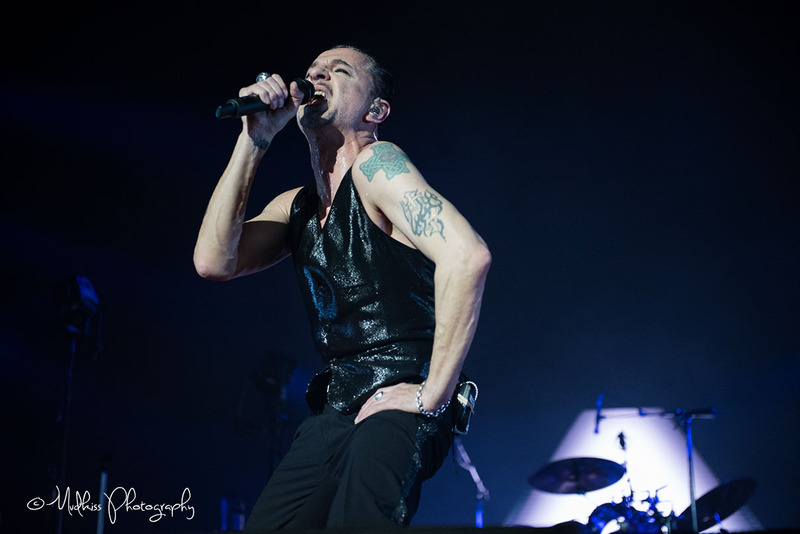 With these elements, among others, Depeche Mode has in the past created gloriousness and indeed continue to originate. Combining their past and present on the Arena stage was a celebration of both and worthy of the applause and adulation they received. Together the five men meet centre stage take a bow, wave and blow kisses as they leave the stage. A minute or two of darkness teases the possibility of more only to be as quickly sunk as the lights go on. 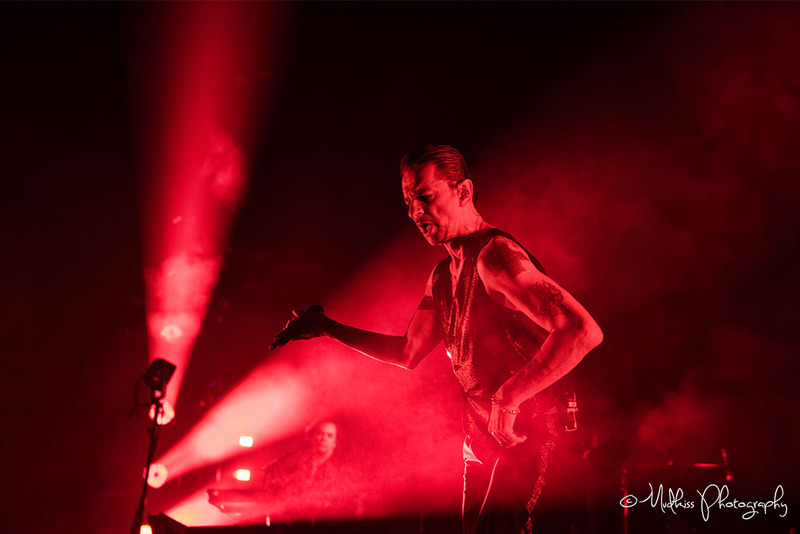 You can follow Depeche Mode’s Global Spirit Tour, new releases and other news by visiting their official website, liking them on Facebook or following them on Twitter from where they tweet as @depechemode. It is estimated that 663 million people. That is 1 in 10 people in the world lack access to safe drinking water. This lack of safe water spreads disease, compromises safety, makes education elusive, and impedes the economic empowerment of citizens of developing nations. It is what is standing between billions of people and their health, safety, and the opportunity to unlock their true potential. Depeche Mode and Hublot have partnered to raise funds and awareness for charity: water, to bring safe, clean drinking water to people in need around the world. During the Global Spirit Tour, Depeche Mode and Hublot have committed to bringing clean water to more than 50,000 people. Click here for further information. Words by Katie Clare. More articles, reviews and interview’s by Katie on Louder Than War can be found at her author’s archive. She can also be found on Twitter where she uses @tokyo_katie. Photos by Melanie Smith. More work by Mel on Louder Than War can be found at her author’s archive. You can find her on Facebook and Twitter. Photography portfolio can be found here. Thank you for the review. I last saw them in 2006 & I am so excited to be taking my partner tomorrow night. She is not a huge fan but I’m sure by the end of the evening she will be blown away. Corbijn work is indeed hypnotising. Thanks for this write up it was a nice way of putting the night together.